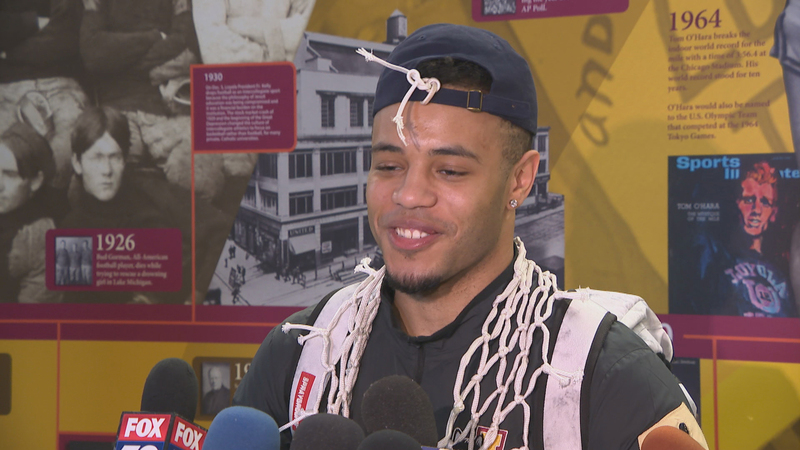 The Loyola Ramblers are headed to the NCAA Tournament for the first time since 1985 with a victory over Illinois State in the Missouri Valley Conference tournament championship game. Loyola never trailed in the game and beat Illinois State in resounding fashion, the 65-49 win ensuring a trip to the Big Dance. The team’s homecoming was a bit muted because Loyola students are on spring break. But the team’s biggest fan, their 98-year-old chaplain Sister Jean Schmidt, was there to greet her beloved Ramblers. She’s a faithful fan who prays with the team before every game. Her prayer before the championship game? “I began yesterday by saying: Oh good and gracious God, have those Redbirds fly high and miss their baskets,” she said. Ramblers coach Porter Moser has been leading the team for seven years, but throughout this now 28-win season, he never talked about the NCAA Tournament. “Sister Jean? She’s our heart and soul,” said guard Marques Townes. The Ramblers were the No. 1 seed coming into the St. Louis “Arch Madness” tournament as the Regular season Missouri Valley conference champions. The team credits great chemistry and selflessness to their winning ways. Who the Ramblers will play and when won’t be determined until Selection Sunday this weekend. “Selection Sunday is going to be a blast. Just to be able to sit down and watch that and knowing that we’re going to be in it is going to be special,” said Custer. “The way I do my brackets is – I don’t put any money on it because that’s not allowed. I have to make that clear. I start with the teams that I’d like to win. I’m not an expert but I have fun doing it,” said Schmidt. The Loyola Ramblers good luck charm is ready for March Madness. She’s going to the Big Dance with the team despite her bad hip.